See calendar of dates below. Contact us for availability. Shooting the night sky in a dark area of the world can be a memorable and mesmerizing experience. The vast size of the galaxy and stars beyond in contrast with the landscape below is striking. 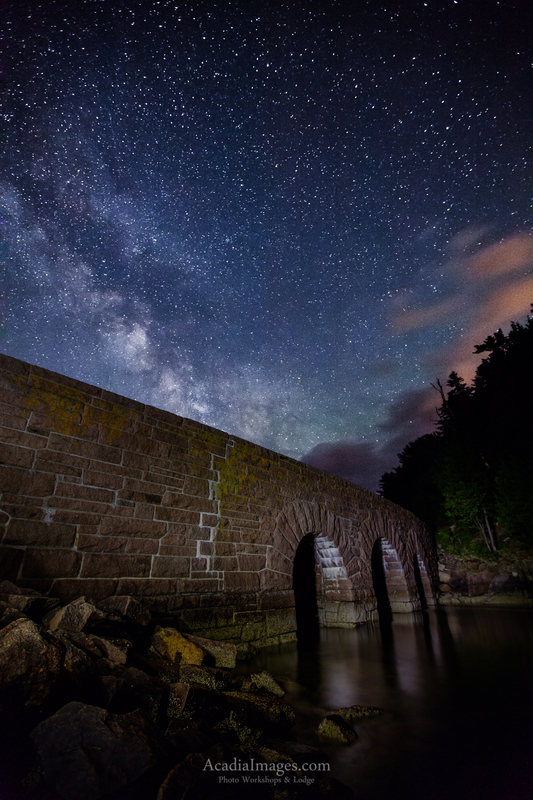 Acadia is not only a dark area of the East Coast, but also features a fairly light-free view south over the ocean toward the core of the Milky Way. If you were recently inspired to try night sky landscape photography there are few better places than Acadia to learn. Most newer cameras can capture the stars but this is one area of photography where better gear yields better results. For the best results you’ll want to have a full frame DSLR and wide angle lens at least f/2.8. If you have an older camera or want to insure that you return with optimal quality results you can rent a camera and lens from any of a multitude of rental companies online. Some newer crop sensor camera work, but you’ll want to have a very wide angle lens to accompany them. Please contact us if you have questions about your equipment.